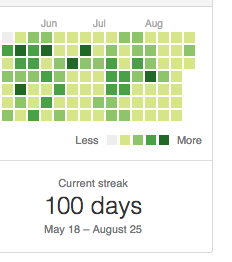 Today marks 100 days since I left Vox Media to work on ottoneu full-time. I only decided to give notice once I set some goals for myself, and 100 days seems as arbitrary a time to check in on progress as any. Without casting aspersions or unpacking my various neuroses, it was pretty clear that I was very unhappy with my full-time job. Once I recognized this, I had to move on to another project, because it was clear that the enjoyment I had working at Vox Media was not going to return. Until biting the bullet and leaving Vox, I was not sure if my unhappiness was directly related to my job or if my unhappiness at work was a symptom of something else. I can say pretty confidently that I am happier now for a variety of reasons, so in the end that is all that matters. I loved working at Vox Media and gained some of my best friends while working there, but all things must draw to an end so that the next thing can begin. I eat out less, I cook more, I eat fruit, I don’t have soda or a fistful of M&Ms available whenever I want, and thus I have been eating healthier. Most of this is due to my wonderful girlfriend, who I live with as of last week. She does crazy things like “buys groceries” and “encourages me to eat things other than candy and meat”. Either way, healthier eating was a goal going into this whole thing and progress has been made on that front. I’ve had one completed contract, one contract that is on-going, and potential for a couple more contracts in the near future. If you want to get a contract, you are not above getting a beer or taking a phone call with anyone. I took all the phone calls, listened to all the half-assed ideas, went to bars in faraway lands like Foggy Bottom and West End, and I landed enough income to keep things going for a few more months. Without a full-time job, I believed that this effort was required, and it has paid off so far. Eating out less helped a lot on this front, but making a plan with Kacey and keeping track of it has helped a lot too. It is also a lot easier to mindlessly buy things when you have a full-time job than when you don’t. There is still a lot to be done to improve this, but the plan is continuing to come together. I’ve accomplished all of these goals to various degrees. I know I could still eat a bit healthier, but who couldn’t? I could always be happier, but again, who couldn’t? My mood has improved a lot, my diet has improved a lot, I feel in control of my own destiny, and hey, I launched a fantasy football game too! Overall, I give myself a B+.